Don’t you just love it when the words healthy and cake appear in the same sentence? I am a huge fan of cake and I do love to have a slice for a little treat with my morning coffee, but I always feel a tad guilty about it. So, I love it when I discover new products and recipes for healthier treats. 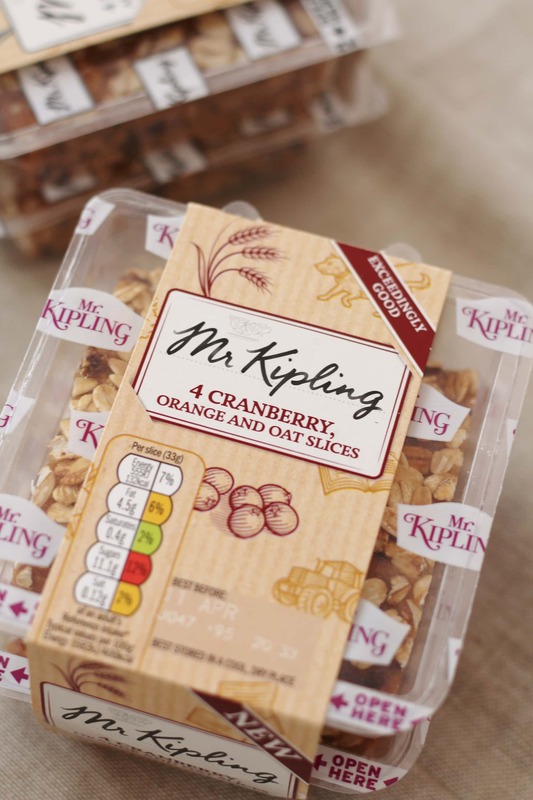 I was therefore delighted when the lovely people at Mr Kipling contacted me and asked if I would like to try their new range of healthier cake slices. Now there are many good things I associate with Mr Kipling, but ‘healthy’ is not one of them! (I have to admit to having something of a weakness for their angel slices.) 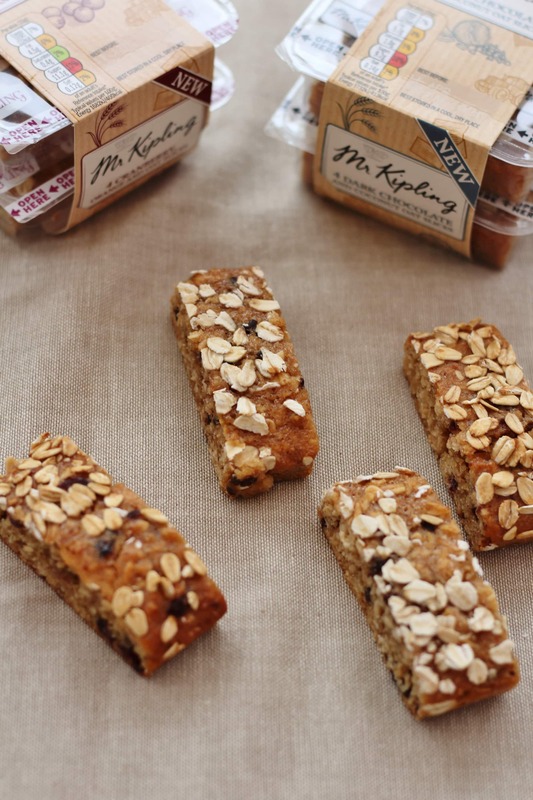 However, with their new range, they have produced some delicious tasting, healthier cake slices. Ah…music to my ears. Mr Kipling wants to encourage us all to #breakforcake (I really don’t need much encouragement) and has recently launched Exceedingly Good Slices as an alternative to a traditional morning snack – designed for those of us who would like a little something sweet to break up our day, but would like something with some added goodness, so we don’t feel too guilty! These little individually wrapped bars combine the sweetness of a traditional cake bar with wholesome ingredients such as cranberries, orange and coconut. They also contain oats to provide extra nutritional goodness and slow release energy, helping stave off those hunger pangs until lunch. They have also kindly donated a hamper full of Mr Kipling goodies for one of my lucky readers – you can find details about how to enter the giveaway at the bottom of this review. 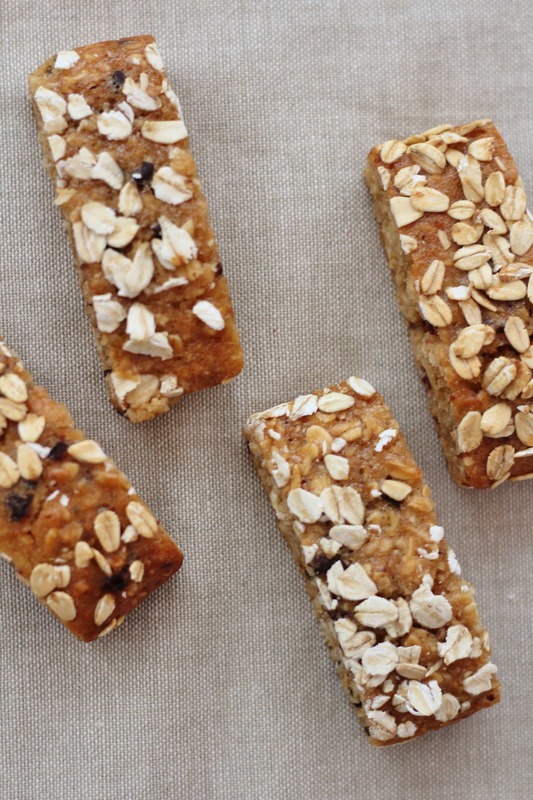 The oats give the slices a really unusual, but really rather delicious texture: somewhere between a cake and a flapjack. I particularly liked this – it’s nice to taste that there are real oats in there (30% according to the packet). I’m not sure I’ve come across anything with this kind of texture before, but it’s really rather yummy – and something I rather fancy having a go at recreating myself. We began by tasting the cranberry and orange flavour. They really did taste of orange with lovely chunky bits of cranberry – my only slight negative point would be that this flavour combination was a little on the sweet side for me, but I don’t have a massively sweet tooth – if you like a touch of sweetness, these would be perfect. The second slice we tried was the coconut and chocolate flavour. 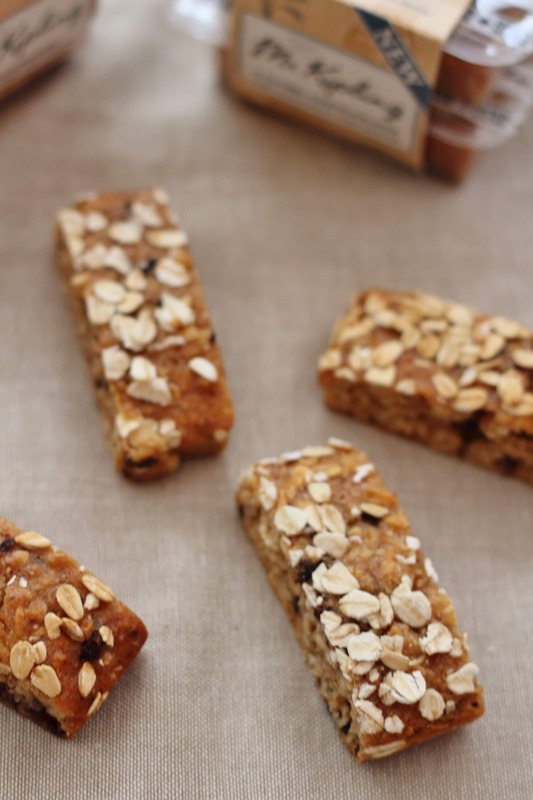 These had the same wonderfully chunky, chewy texture from the addition of oats, combined with a delicate coconut flavour and the delicious addition of chocolate chips. (I find there are few things that aren’t improved by the addition of chocolate chips!) Despite the coconut (which I can sometimes find a bit cloying in cakes, but not at all in this case), the slices were less sweet than the cranberry and orange flavour and, for me, had the perfect balance of flavour and sweetness (and chocolate!) and were definitely my favourite. Unusually, the rest of my family agreed with me. How much do they cost and where can you buy them from? These little cakes currently cost around £1.49 per pack of four. A quick whizz round the internet tells me that they can be bought from Tesco, Sainsbury’s, ASDA and Morrison’s. 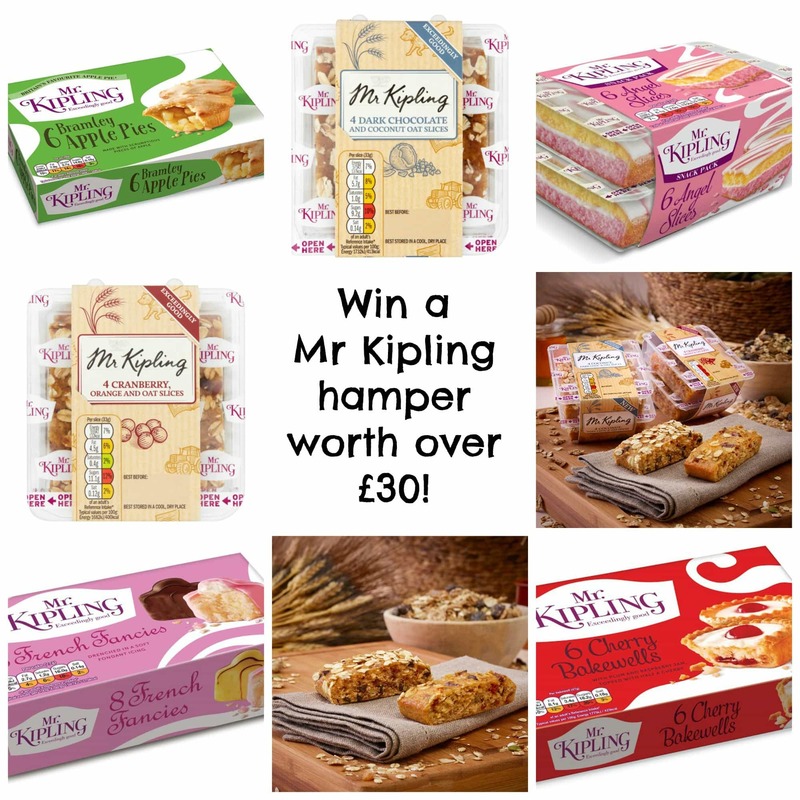 Fancy winning a Mr Kipling hamper for yourself? The lovely people at Mr Kipling have kindly donated a hamper of Mr Kipling goodies for me to give away to one of my wonderful readers. 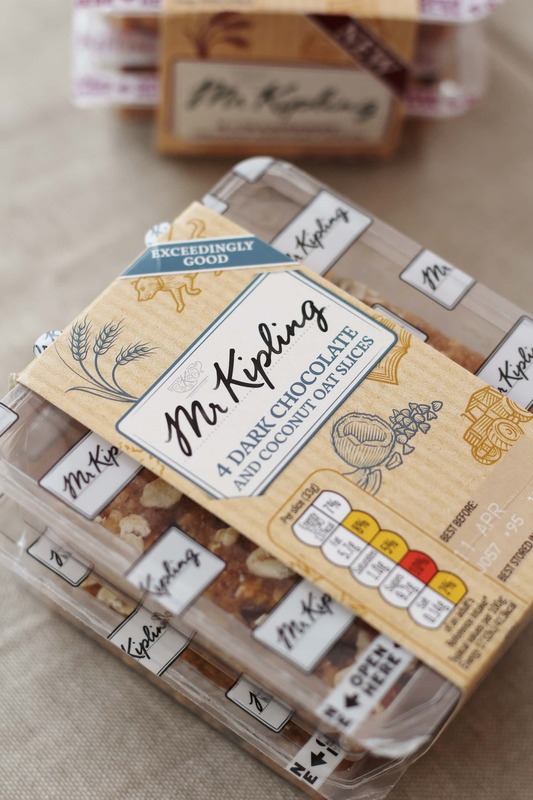 The hamper is worth over £30 and will be filled with a selection of Mr Kipling classics, such as Angel Slices, French Fancies and Battenberg Cake, as well as both flavours of the new Exceedingly Good Slices. All you have to do to enter is write a comment in the comments section at the bottom of this post and complete the Rafflecopter widget to say you’ve done it. If you want to, you can get extra bonus entries too! Just follow the instructions in the widget below. Rafflecopter is a little widget that allows me to run a kind of raffle on my website, except instead of entering by buying a raffle ticket, you enter by doing things such as commenting, following me on Twitter and visiting my Facebook page. For one entry, all you have to do is answer this simple question: What is your favourite mid-morning snack? Once you’ve done this, the Rafflecopter will unlock all the other ways you can enter, but don’t worry – you don’t have to do them all (though I’ll love you forever if you do 🙂 and remember, the more entries you make, the more chance you have of winning!) When the competition closes, the little widget will work its magic and select a winning name at random. I will then contact the winner via email to arrange for the hamper to be sent to you. I have shared this competition with ThePrizeFinder – check out their website for more competitions and giveaways. A McVities dark chocolate digestive. My fave snack is mini malt loaf soreen bar, perfect for an energy boost. when I am at work I normally have a packet of sesame snaps and a banana mid morning. It has to be a bit of cake for me in the afternoon with a cup of tea! I don’t usually eat between meals but if I am hungry I’ll have a yoghurt or pot of custard. Normally a digestive biscuit or 2!! I like eating cake the best but I try to eat fruit or vegetable sticks! I have a tendency to reach for the biscuits which I definitely need to stop! I eat my kids’ leftover breakfast (eg pancakes)! My favourite mid-morning snack is savoury flavoured popcorn and a hot cup of tea. Loves good piece of cake!!! Fruit such as banana or apple. Trying to be oh so good so just a decaff coffee! A slice of bread and butter with marinate. I Enjoy a Banana for a med morning snack! I love Banana Bread . Mr Kipling’s French fancies are my favourite morning snack. I love a blueberry smoothie! An apple is my snack. My snack is a slice of chocolate fudge cake. Mine is chocolate fudge cake slice. An apple. Preferably a Fuji but I’ll make do with a Royal Gala. Mt favourite mid-morning snack is a scone. Mini malt loaf. Love an almond slice or a bakewell nomnom! 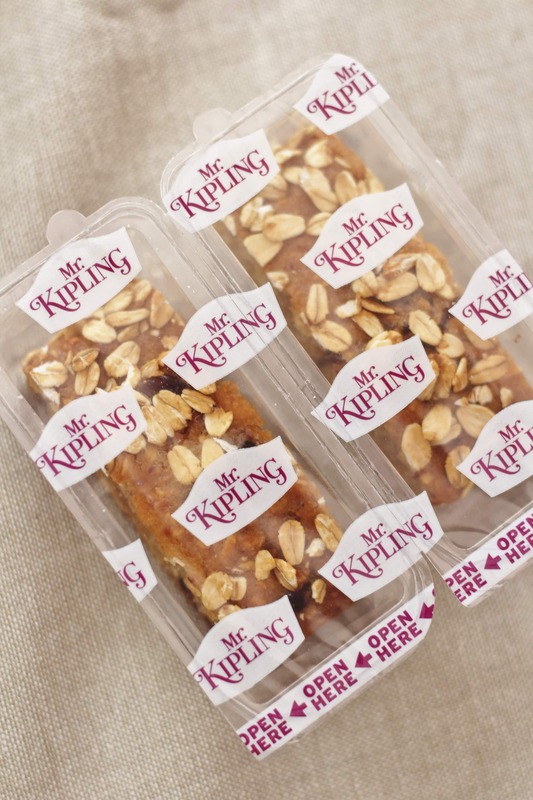 A nice slice of cake – Mr Kipling’s would be perfect! Working nights i like a welsh cake at 3am. Has to be a cuppa with a cherry bakewell ! I love chocolate, but i find a banana is always a great alternative. i like those breakfast bars! I love lemon drizzle cake, as well as killings Angel slices. Those are my two favourites! a cup of tea and a biscuit! Dark chocolate & coconut sound divine! I have my breakfast, toast or museli at mid morning as i dont feel hungry at breakfastime. A dark chocolate brioche with a cup of tea. A cup of tea and buttered crumpets are my favourite mid-morning snack. Mid Morning I like fruit – cake is for afternoon! A nice piece of ginger cake, helps settle the stomach with a sweet sugar hit, perfect with a cuppa! I have a banana so I can then save my treats for the evening! Now that the ginger nut biscuit shortage is over, I’m back to scoffing a few of these with coffee. I like some pitta bread and some houmous or unsalted cashew nuts and fruit if i’m being healthy! I never usually snack, but if I have anything it’s most likely to be a smoothie. I love crumpets with loads of butter!! I try not to have a mid morning snack. Usually a banana as it is a healthy mid morning snack. Depends on my mood… Usually fruit (an apple, a satsuma or some grapes) but if I’m craving something a bit more filling a flapjack usually hits the spot! I love snacking on roasted chickpeas! A banana with a yoghurt. A cup of tea and some chocolate digestives. Usually a banana but can often be swayed by a piece of cake! My mid morning snack has to be a cereal bar! It’s a banana for me. I love a soft boiled egg. I want to say something healthy and I do try to be healthy, but I would be lying if i said it was my favourite, my favourite would have to be chocolate!!! Either some nuts and raisins or a couple of biscuits. 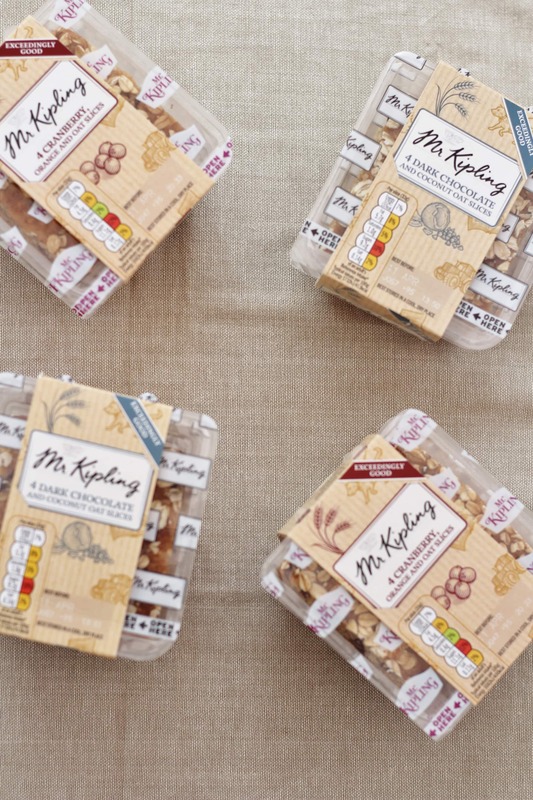 Love Mr Kipling cakes….they always remind me of Sunday teatime at my nannyshouse when I was a child…she would serve a selection of Kipling cakes….just delicious. I love a punnet of blueberries! Granola flapjack – I’d like to say I make my own but I usually buy a bag from the place that’s “Good with food”! I love carrots and hummus and when I’m feeling naughty, chocolate. I munch on almonds and apples. I don’t tend to snack mid-morning that often – if I do it’s generally on frozen berries and fat free natural yoghurt! My favourite mid-morning snack is an apple (if I’m being good), or a chocolate chip cookie (if I’m being naughty)! Generally I have a cereal bar or a bit of fruit if I am hungry mid morning !! A biscuit and cuppa tea. Alpen Light Cherry Bakewell bar! Has to be a country slice and a coffee. When I was working we always had toast and jam from the hospital canteen and I am still a fan but I also like a banana! I love to have a chocolate biscuit with my cup of Coffee mid morning. Strawberries are fave of mine at this time of the year. A couple of rich tea biscuits with a cuppa tea. I always have a few biscuits around 11am, they can be any variety I’m not fussy !! A Frency fancy and a coffee! I like to have a couple of chocolate biscuits with a mid morning coffee. I like a piece of cake or muesli bar. I would like to say fruit but really it would be chocolate. Having breakfast at 7.00 a.m., I try to wait until about 11.30 when I will have a banana which keep me ticking over until lunch. However, if my tummy start rumbling by about 10.00 then I have a cereal bar. I know it should be a banana, but I do like a Club chocolate biscuit, orange flavour. A banana – but I sometimes treat myself to one of my favourite Mr Kipling French Fancies and a cuppa! Tea with a few chocolate biscuits ? Depends on what I ate for breakfast! Sometimes a banana, sometimes a yoghurt, sometimes nothing and occasionally whatever naughty treat I have left over! A delicious Mr Kipling Apple Pie! A cup of coffee and a sneaky little bit of cake.! Mid morning is always a cuppa tea and small cake or biscuit I do like the Kipling lemon slices yum.. I don’t really have a mid morning snack but I would probably say fruit cake! I tend to have my lunch mid-morning before going to work! salt and vinegar rice cakes with cream cheese! My favourite mid morning snack is a cup of tea with a Mr Kipling Pink Angel Slice – perfect feel good snack! I usually have a banana and a cup of tea as I’m at work and don’t have much time. I try to be healthy and stick to fruit or nuts, but I can’t resist my own baking and if it’s there, I’ll eat it! My favourite snack has to be brazil nuts! Impressed with the new healthier range! cake. no, chocolate. no, cake. Hang on: chocolate cake, yes! A mr kiplings apple pie and coffee ? I am really Into alpen cherry cereal bars right now. Fill the belly till lunch time, and LOVELY and healthy too. Toast with lots of butter! Rich tea so I can dip them in my tea. Free range eggs on toast from my chickens ?? Would love to win this. Have 4 different packets of the slice cakes and a box of french fancies. Love Mr. Kipling! A cereal bar, i’m quite fond of Brunch Bars. It changes, just now it is oranges lol. Mr Kipling is the best amazing cakes just as it says on the packet not tryed any of the new range yet ? A cup of tea and a chocolate digestive or two! Thank you to the masses of you who entered my competition to win a Mr Kipling hamper!! And for all your lovely comments, likes, follows, tweets and shares!! I will be announcing the winner shortly…so pop back later if you want to find out who won!